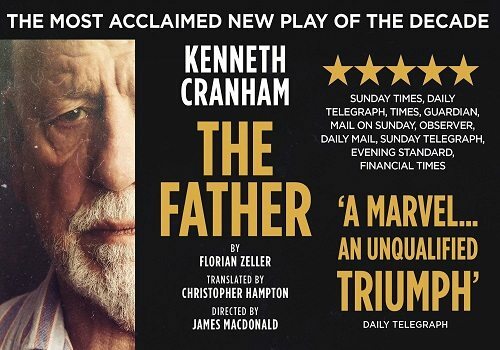 Kenneth Cranham reprises his role as Andre in Florian Zeller’s Moliere Award-winning play, The Father. After successful runs at London’s Tricycle Theatre, the Ustinov Studio in Bath and the Cambridge Arts Theatre, The Father played at the Wyndham’s Theatre starring Cranham alongside Outnumbered actress Claire Skinner. Now, the critically acclaimed play heads to the Duke of York’s for a five-week limited run, before embarking on an extensive UK tour. The Father follows 80 year old Andre, who cannot remember whether he was once a tap dancer or successful engineer. The one thing he is certain of is that he lives with his daughter Anne and her husband, Antoine. But then again, Anne looks rather different, and doesn’t she live with Pierre? A gripping study of dementia, The Father examines how the mind can be sharply thrown into deterioration, without ever even realising. Directed by James McDonald (Bakkhai at the Almeida), Kenneth Cranham has received wide critical acclaim for his portrayal of Andre, in what is a heart rendering and, at times, devastating play. Cranham will be joined by Amanda Drewe, who will play Anne, as well as Rebecca Charles, Brian Doherty, Daniel Flynn and Jade Williams. The creative team includes Set Design by Miriam Buether, lighting by Guy Hoare and sound by Christopher Shutt. The Father arrives at the Duke of York’s to play a strictly limited five week season, opening on February 24th and playing until 26th March 2016.